Cook the pasta as per the package instructions; strain and let cool. Meanwhile cut the cheese and pepper. Insert on the sticks, in the desired order along with the salami, tortellini and tomatoes. Place on a dish, cover with plastic and refrigerate until you serve. You can substitute the cheese with mozzarella, use prosciutto and anything you could think of and/or have available in the fridge, don't limit yourself with the ingredients. Summer is upon us, and with it the overwhelming heat that calls for spending time on outdoor activities at the beach or at the pool. So, what about the cooking? I know we want easy and refreshing options that can get done fast, so we can run from the kitchen. Craving salads, fruits and cold soups is the norm for me. 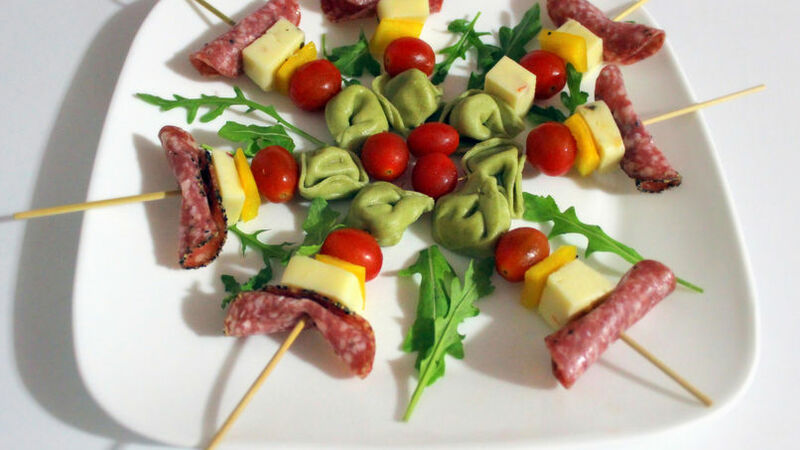 If you identify with me, I invite you to prepare these pinchitos con tortellini (tortellini skewers), a delicious way to eat without having to cook for hours, since the pasta cooks in 5 minutes and the rest of the ingredients are cold. How do you like that?! I recommend them because they are flavorful and great to share while sitting on the table at the porch or patio.